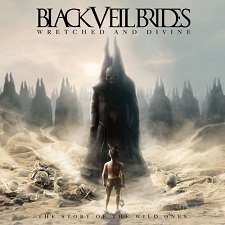 Revivalist glam rockers Black Veil Brides have released their third studio album, a concept album called Wretched and Divine: The Story of the Wild Ones. Wretched and Divine tells the story the rebellious "Wild Ones" who defend their lives and spirits against the controlling organization F.E.A.R. F.E.A.R. stands for "For Every and All Religion" and is voiced by Wil Francis of William Control and Aiden. Spoken interludes that sound like radio broadcasts--known as the "F.E.A.R. Transmissions"--help the album flow and to tell the Wild Ones' tale as a rock opera. "Exordium" kicks off the album. It introduces listeners to the F.E.A.R. organization and to the religious imagery that will play a major role throughout Wretched and Divine. "Exordium" features lyrics about the Kingdom of God, which are spoken dramatically over low music that sounds like it is just dying to erupt. And it finally does--into the album's first song "I Am Bulletproof". "I Am Bulletproof" starts off with a slow and rather eerie piano melody, but the hard rocking guitars from Jinxx and Jake Pitts quickly join in. The riffs are immediately fast and heavy, and they evoke a pure metal sound that would please even the staunchest Iron Maiden or Judas Priest fan. As Andy Biersack's vocals hit with the first lyric "Here we go!" the song instantly becomes a rock anthem. Biersack's vocals are raw and powerful, and they really illustrate the song's lyrics about invincibility and strength--being bulletproof. The guitar solo is great, and the blistering fast notes and crystal clear pitch give this song even more of a decadent metal feel. The album's title track, "Wretched and Divine", begins with thunderous drumming from Christian "CC" Coma and heavy guitars whose riffs become more intricate as the music leads up to the first verse. Just like "I Am Bulletproof", "Wretched and Divine" features another anthemic sing-along chorus that would surely be the highlight a Black Veil Brides concert. The song's lyrics are about being an outsider but being cool with it--even being empowered by it. This concept reflects the contradictory album and song title "Wretched and Divine". "Devil's Choir" features a militant drum march intro followed by a blazing guitar melody. It starts out as a heavy song, as the title and intro would lead you to think. The chorus, though, is very melodic, catchy, and bright. It also contains some great backing vocals. This chorus almost doesn't fit, but it strangely does. Maybe it's a part of this whole "wretched and divine" paradox? "Devil's Choir" is later brought back to its metal beginning with a hard and heavy guitar solo. "Overture" is the entirely instrumental track in the middle of Wretched and Divine. It sounds purely orchestral, but it does contain musical themes and melodies from the album's other tracks. It features a gorgeous string arrangement from the ultra-talented and versatile multi-instrumentalist, Jinxx. Not only does he play guitar, he plays the violin, cello, and piano as well. I was instantly glued to the track "Nobody's Hero". It's fast, it's heavy, and it's definitely one of the harder songs on the album. The whole song is killer, but I especially love how right before the guitar solo, there's this huge guitar screech that is just so '80s. "Nobody's Hero" really reminds me of "Unbroken", the song Black Veil Brides lent to last year's Avengers movie soundtrack. The lyrics about being "a loaded gun" and "on the run" could easily be about vigilante superheroes. It would be such a mistake if this song weren't featured on the Avengers 2 soundtrack in the future! "In The End" was the first single from Wretched and Divine, and it was also used as one of the theme songs for last year's WWE Hell in a Cell pay-per-view special. It has choral style singing in the intro, which also features a string arrangement that subtly remains throughout the rest of the song. It has fast, intricate guitar notes just before the vocals it, and the chorus is catchy with the many "woahs" in the backing vocals. The lyrics, which are about not being afraid to die, but wondering how you'll be remembered, are powerful and moving. "In The End" may be an appropriate name from the final song on the album, but it is not the final track. Wretched and Divine: The Story of the Wild Ones ends with the final F.E.A.R. Transmission, which says F.E.A.R. has been defeated by the Wild Ones. However, the mysterious voice continues to taunt the rebels, telling them they can never truly escape F.E.A.R. There's definitely room for a sequel. 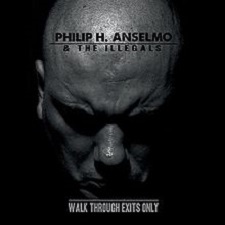 I thoroughly enjoyed this album--the music AND the lyrical subject matter. While the songs from Wretched and Divine focus on being an outsider and just being plain different, they do not have that whiny and insufferable, "Nobody likes me, I don't belong, so I'm going to go kill myself!" attitude that plagues a lot of the modern rock music--and often causes people to make fun of it. Instead of that, Black Veil Brides offers an alternative that steps up and says, "By God, I'm not like everyone else! I'm better, and I'm going to rise above and show them all!" It's rebellious, but in a very positive way. I also can't say enough about the excellent guitar work of Jinxx and Jake Pitts. They both have a clear, dynamic, and powerful playing style. Not only were these guys classically trained and influenced by the works of Bach and Beethoven, you can very much tell they were raised on the metal classics too. That particular combination is known to breed good metal guitarists! This duo works so well, and they certainly boast some of the most impressive guitar skills I've heard from the newer hard rock and heavy metal bands. If you don't think this album sounds quite theatrical and dramatic enough for you, Black Veil Brides has created an accompanying film for it called Legion of the Black. It has seen some limited release through Internet streaming on Facebook, and the band will also be releasing it with an upcoming special edition of Wretched and Divine: The Story of the Wild Ones.